is the "educational and scientific center of Siberia." We visit the little rustic Orthodox church in the woods where I continue buying small icons for souvenirs for friends and family back home. A friendly Russian Blue cat greets me in the church yard. We visit the inside of the church, and we are told not to take pictures. I had already snapped one - and the flash was accidentally on. There was no-one inside except for two women who was overseeing things in the absence of the parish priest. Father Pavel explains that this congregation is very strict. It is simple by Orthodox standards. We leave the sanctuary and enter the kiosk on the church grounds where icons are sold, and I buy a few. We leave, and I am a bit concerned that the cat is going to follow me. He tails us for a good while, but ducks into one of the outbuildings after saying goodbye. Pavel takes us along a gloriously picturesque path that leads past the houses of some professors and research scientists: nice by American standards, affluent by Russian standards. 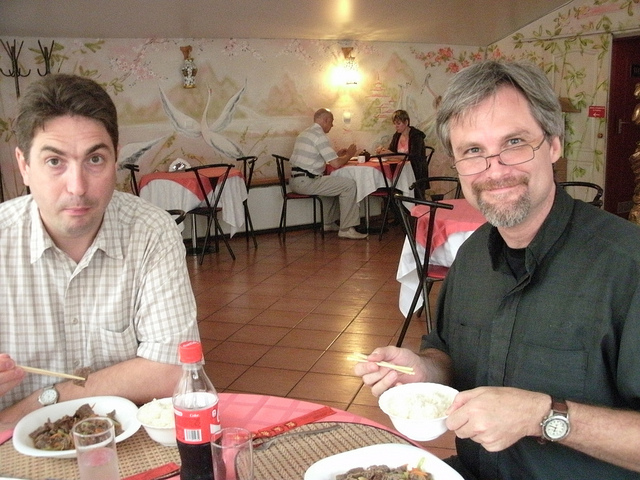 We drop into a Chinese restaurant near the shopping center. They take Visa, and so I pick up the tab. It is one way for me to say "thank you" to our gracious hosts. It is a very nice and cozy place, decorated in typical Chinese restaurant style that one sees in the States - except for the Cyrillic lettering (which is stylized to look like Chinese characters). I have a ginger beef dish and a Coke - and I use chopsticks. Pavel is a good sport and takes up his chopsticks as well, but gives up and returns to his fork about halfway through. Dan sticks with western cutlery and enjoys his meal as well. We stroll to the shopping center, where Father Pavel purchases some chocolate bars for Father Dan to present to an American pastor and his family as a gift. I buy a few bars for Grace as well. We walk to Pavel's flat for coffee and dessert. He retrieves three varieties of ice cream from the freezer, and makes coffee in the auto-drip. Pavel is very fluent in English and has a quick wit and sharp sense of humor. We take our chairs into the bedroom and set up a small coffee table for our visit. Father Pavel also presents some chocolate chip cookies, and pronounces them to be a great import from America. I reply that we export both good and bad - like chocolate chip cookies over and against Lady Gaga. We walk back to the seminary as we need to start getting ready to catch our train. With a twinge of sadness, I realize that we will be leaving Novosibirsk, not to return this trip. I pack hastily and drop off the room key for Pavel's office with the guard. I need to return Olga Suhinina's phrase book, and I ask the guard where her mailbox is. The guard does not speak English, but he gestures to indicate that Olga is upstairs. I find her in the translator's office, say goodbye, and return her book in person. I meet Dan outside where we wait with our bags packed and ready to go. Father Pavel and the bishop drive up. Bishop Vsevolod presents us with gifts. Dan is given a genuine Russian Army canteen, and I am presented with a Soviet sports jersey, as the bishop explains that I am now "part of the team." We pose for pictures and say goodbye to Father Pavel. We pile into the bishop's car and drive to Alexey's. Father Andrey is there to greet us. He is concerned about his eight-year old daughter Alexandra , who is having heart problems. We say goodbye and take pictures. Father Alexey emerges from his building wearing a New Orleans t-shirt. The bishop drives aggressively, often driving on the lines instead of between them. Dan and I both check the buckles on our seat belts. The bishop is playing his eclectic collection of favorite Beatles' tunes - which he explains helped him to learn English many years ago. After driving a ways, we turn back toward Alexey's, as he forgot something back home. I begin to worry that we might miss our train. Siberians are delightfully phlegmatic about such things. Well, we actually arrive with plenty of time to spare. We hang out at the Novosibirsk train station. I realize that I have left my camera in the bishop's car - again! Unbelievable! I left my camera behind in my first ride with the bishop, and now have repeated the error in my last ride with the bishop. I'm rather embarrassed by this. Undaunted, Alexey calls Vsevolod on his cell to check for me. Dan and I take a little walk around the station. I found a kiosk selling icons. I buy a couple. I check back with Alexey who hands me my camera. I apologize. He shrugs and says: "It happens." 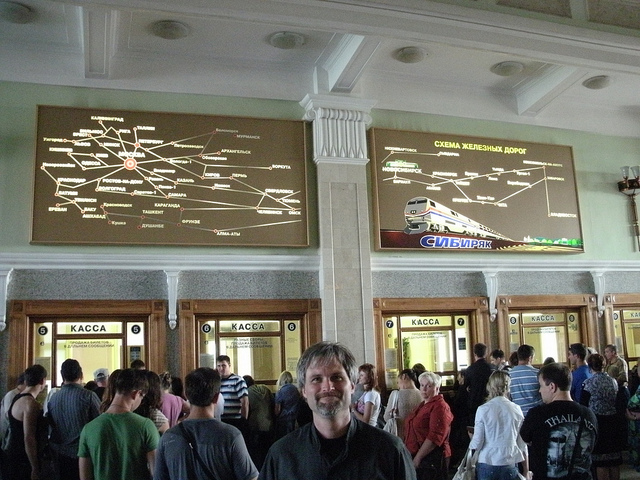 Dan and I went upstairs to see the the huge mural of the map of the Trans-Siberian Railway. We take some pictures. A uniformed guard comes over to us and explains that we can't take pictures. We apologize ("Извините! "), and he is very nice about it. One of the kiosks is also selling matryoshka dolls. Funny (considering the Transsiberian movie). We board our train - which is nice, new, and has air conditioning. It is nicer than any Amtrak train that I have ridden. 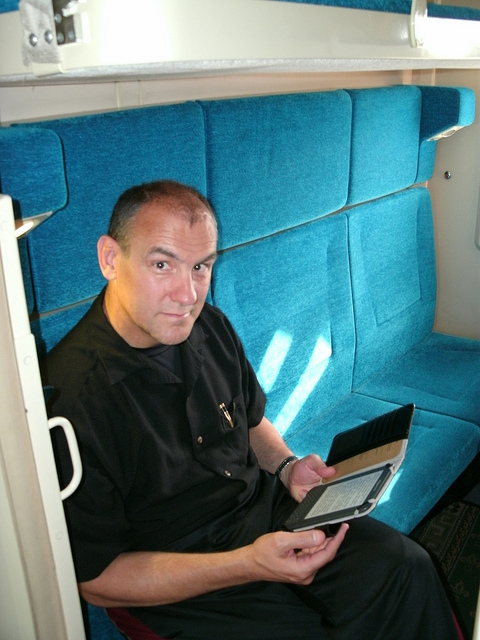 Father Alexey explains some of the history of Novosibirsk as the train lurches from the station. We take pictures. Dan shoots a picture of Alexey and me - he clad in his New Orleans shirt and I in my CCCP (USSR) jersey. Father Alexey has brought water and delicious sandwiches for us - made by Elena. We are avoiding the dining car as it is expensive. Alexey also has tomatoes, cucumbers, and nuts. I used Dan's phone to send Grace a text message that I was now on the Transsiberian Railway and that I have matryoshka dolls in my bag. Ha! She later tells me that she did not find that too amusing. This is a very relaxing ride, and I greatly look forward to extended conversations with my clergy brothers. We discuss American and Russian literature, Alexey's time in the U.S., and of course, church matters. The bathroom on this train is top-notch - even by American standards - a bio-toilet that can be flushed any time and nice hot water from the sink faucet! 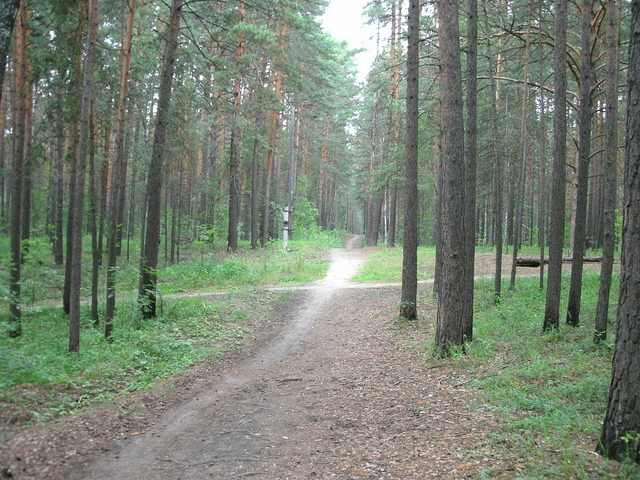 We stop at Barabinsk, between Novosibirsk and Omsk. We step outside in the rainy cool air to buy chips from a vendor. I get a Coke. All that is available is a two liter bottle. It costs 100 rubles (about $3.50). I think Alexei is amused at this. We fix up our beds - which are really nice - and we call it a night. I journal in my bunk and shut off my light and turn in about 1 a.m. as it gets dark and the train rocks me to sleep. Here is a link to all of my pictures of Day Seventeen.